Zürich Airport, also known as Kloten Airport, is situated in the city of Zürich. Often referred to as “Europe’s Leading Airport”, Zürich Airport is a manageable size, which affords comfortably short transfer times and routes. Zürich is the perfect city to travel to for trips into the Swiss mountains. Zürich Airport (IATA code: ZRH) is the largest international airport in Switzerland and the principal hub of Swiss International Air Lines. Flights to Zürich Airport are provided by international airlines such as South African Airways, Emirates and Lufthansa. Zürich Airport is a 10-minute drive from the city centre of Zürich. Book your cheap flights to and from Zürich Airport online! Zürich Airport serves Switzerland’s largest city, Zürich, and much of the rest of the country. In 1953, at Zürich Airport, an opening ceremony was held along with a major air show. Zürich Airport has three airside piers known as Terminals A, B and E. The airport has received the prestigious World Travel Award for its user-friendliness and consistently high quality services, seven years in succession. Compare and book your cheap flights to Zürich Airport with Swiss International Air Lines online at Travelstart! At Zürich Airport, amazing flavours from around the world can be experienced through its addition of wonderful restaurants. Enjoy the various eateries, including a jazz café, bakery, coffee shop, fast food outlets and sports bar. There are a great number of awesome shops at Zürich Airport, where you can have a wonderful time shopping for some great items. Duty free stores can be found at the airport, as well as jewellery, accessories, shoes, books and chocolate stores. The Zürich Airport international departures terminal has luxuriating lounges for travellers on Swiss International Air Lines and Emirates, amongst additional lounges. 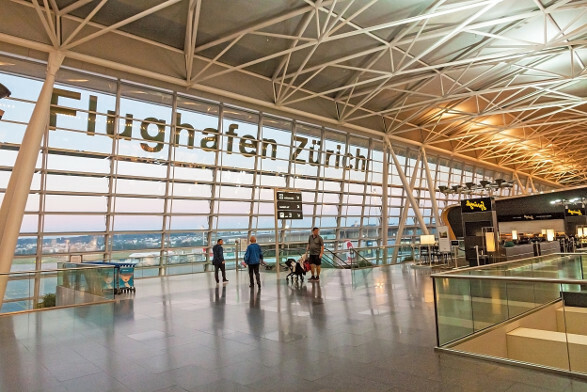 Zürich Airport has a great range of facilities, including ATMs and currency exchange, dental services, a medical centre, a gym and travel agencies. Located in the Glattbrugg business district, NH Zürich Airport Hotel is a 4-minute drive from Zürich Airport. Amenities include free Wi-Fi, ATMs and currency exchange, an airport shuttle, a sauna and a fitness centre. This 4-star hotel is located in beautiful emerald surroundings. It is a 5-minute drive from Zürich Airport. Amenities include an airport shuttle, private parking, ATMs and currency exchange, a business centre and a restaurant. This spectacular eco-friendly hotel is a 20-minute drive from Zürich Airport. Amenities include free Wi-Fi, a sauna, a games room, an indoor and outdoor swimming pool, restaurants and a convenience store. Travellers can purchase foreign exchange up to 60 days ahead of departing for Zürich. Travelex, Travelex Bancomat, UBS AG outlets can be found in the arrivals and airside centre. Zürich Airport offers an extensive array of parking options, including short and long-term parking, renting a parking space and valet parking. Patrons can book a parking space online at Zürich Airport. Take advantage of the discounted prices! Zürich Airport is located 13 km north of Zürich’s city centre. Trains, trams, buses, Uber, metered taxis, airport shuttles, limousines and car hire options are available to transport you from the airport to your destination.